A new version of Personal Gateway is now available for download. 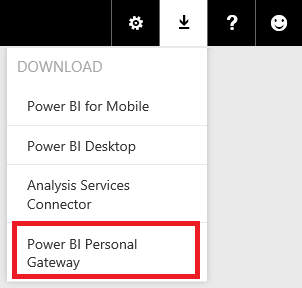 With Personal Gateway, you can keep your Power BI content that connects to on-premises sources up-to-date. You can read more about the Personal Gateway here. The new release is an in-place update and you do not have to uninstall the GA version of the gateway before installing this new version. You can download the gateway from within your Power BI site from the top-right corner. Analysis Services (data import scenario) – You can now use the Personal Gateway to refresh your dataset that imports data from an Analysis Services cube – both tabular and multidimensional models. Instead of live connect to an Analysis Services model, you can import data from your tabular or multidimensional model and keep this data in Power BI up-to-date by scheduling a refresh using Personal Gateway. In addition, we now support org account/oAuth authentication with SharePoint Online. We have made many minor but useful updates to the scheduled refresh settings experience. Give the new update a try and share your feedback with us. And stay tuned for more updates!